Star Wars introduced us to the world of Force powers. Force powers might be really cool and all, but what’s with the robes those Jedi Knights and Knights of Ren are always wearing? What’s the point of having Force powers when you have to dress like some kind of homeless monk? Your child look way more awesome when he’s trekking through battle in a Stormtrooper costume. Now, now. Hear us out. We know that the Stormtroopers are usually the bad guys, but that doesn’t mean your little one has to be evil when he’s dressed up like a Stormtrooper. Just look at Finn. Originally a guy forced to be bad, he’s switched sides and now he’s happy to help the Resistance in their struggle against The First Order. All you need to do is create an elaborate back story for your child and bingo-bango boom! You’ve got yourself a Stormtrooper who’s the hero of the story. Of course, if your child has a little bit of a darker side, then maybe joining The First Order will be right up his alley. 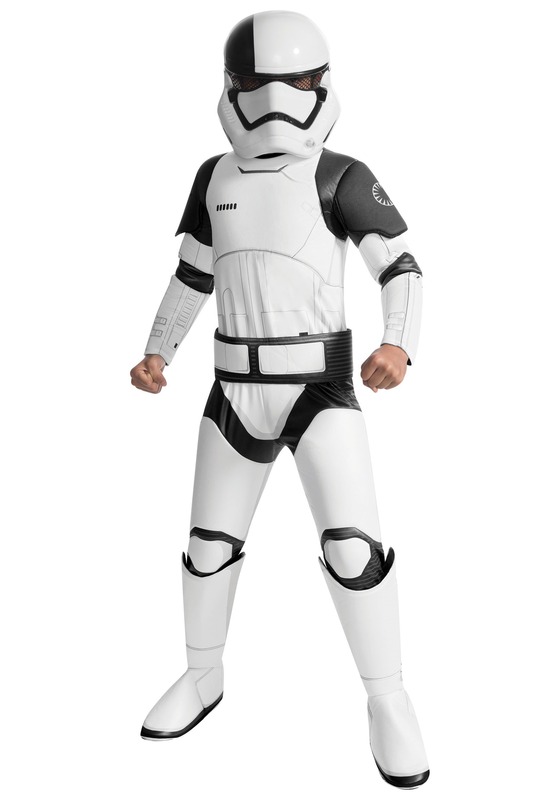 The Super Deluxe Stormtrooper Costume is licensed from Star Wars: The Last Jedi and it’s got plenty of details to satisfy any young trooper in training. It comes with a full jumpsuit that has attached armor pieces and printed details. It also has boot covers and a belt to really give your kid a realistic look. The mask helps your child strike fear into his foes as he stands alongside the rest of The First Order (or lets him covertly try to take down Snoke from within)!